THE STREET tells the poignant, often heartbreaking story of Lutie Johnson, a young black woman, and her spirited struggle to raise her son amid the violence, poverty, and racial dissonance of Harlem in the late 1940s. 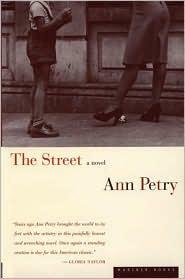 Originally published in 1946 and hailed by critics as a masterwork, The Street was Ann Petry's first novel, a beloved bestseller with more than a million copies in print. Its haunting tale still resonates today. As much a historical document as it is a novel, this 1946 winner of the Houghton Mifflin Literary Fellowship is the poignant and unblinkingly honest story of a young black woman's struggle to live and raise her son by herself amid the violence, poverty, and racial dissonance of Harlem in the late 1940s.